Seorae Galmaegi is a leading brand of Korean Charcoal BBQ for skirt meat (known in Korean as Galmaegisai). A fully-grown pig or cow produces only 250 grams of such meat, where the meat has the perfect combination of tenderness, juiciness and minimum fat. 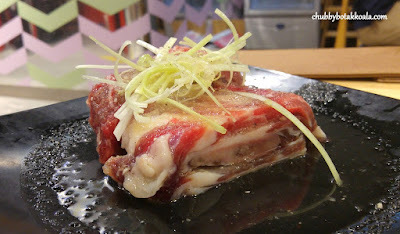 In the ancient times, this meat was serves only for the palate of monarchs and royal families. Seorae Galmaegi open its first shop in Korea in 2007, expanded in Korea and Asia with more than 260 outlets. 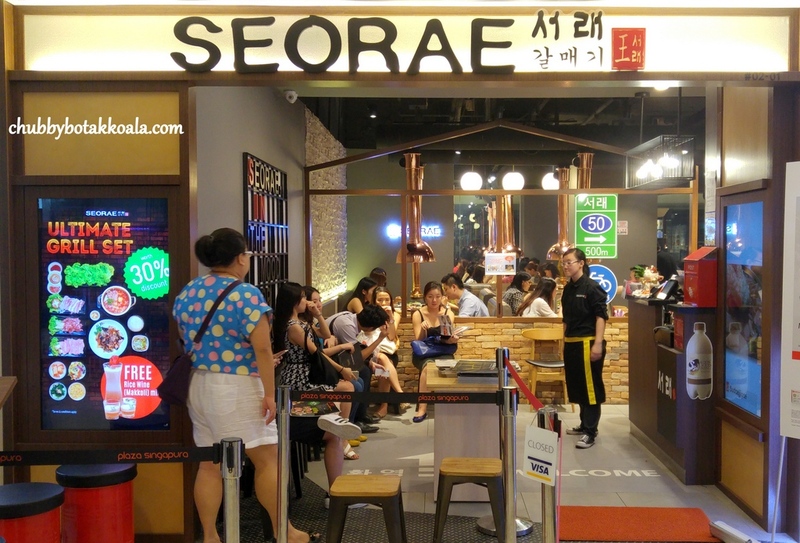 Seorae open its first outlet Singapore in December 2015. As it is only LD and I for this dinner, we decided to try their Pork Set ($79). 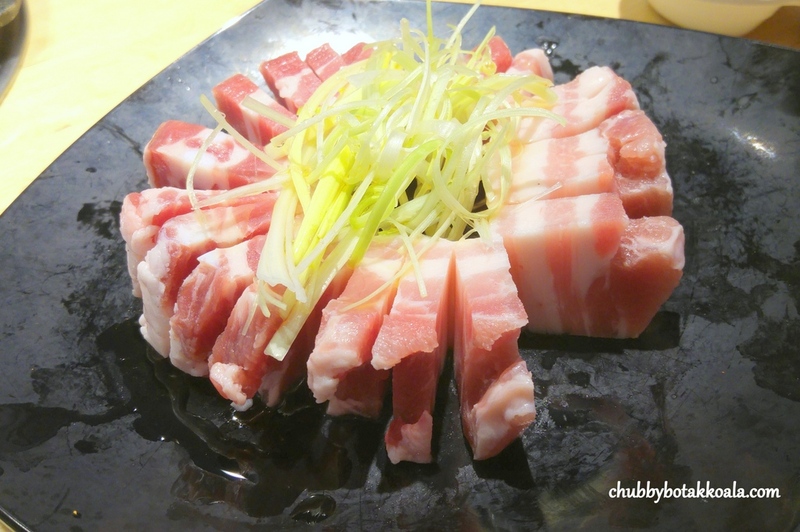 It has three type of pork, Galmaegisal (US Pork Skirt); Hangari Samgyeobsal (Seorae Marinated Pork Belly); and Hangjeongsal (US Pork Jowl). 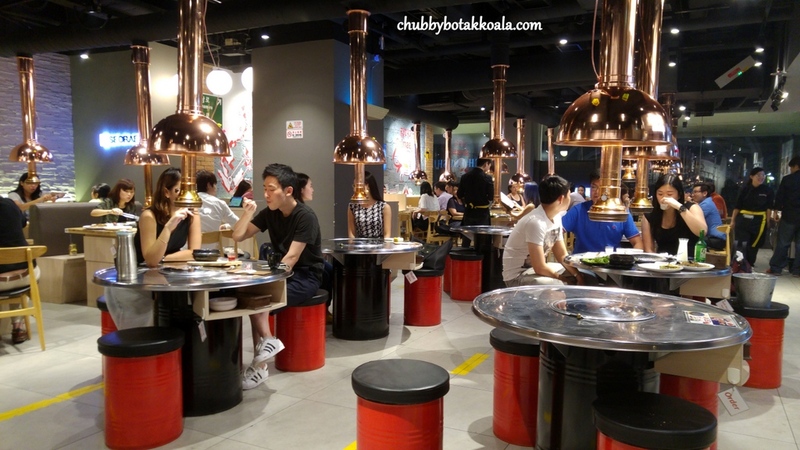 Once you completed your order, the service staff will prepare the charcoal for BBQ. The cast iron base plate for the bbq has different compartments where you can cook you egg and melt your cheese as well. First to the grill as the Galmaegisal. 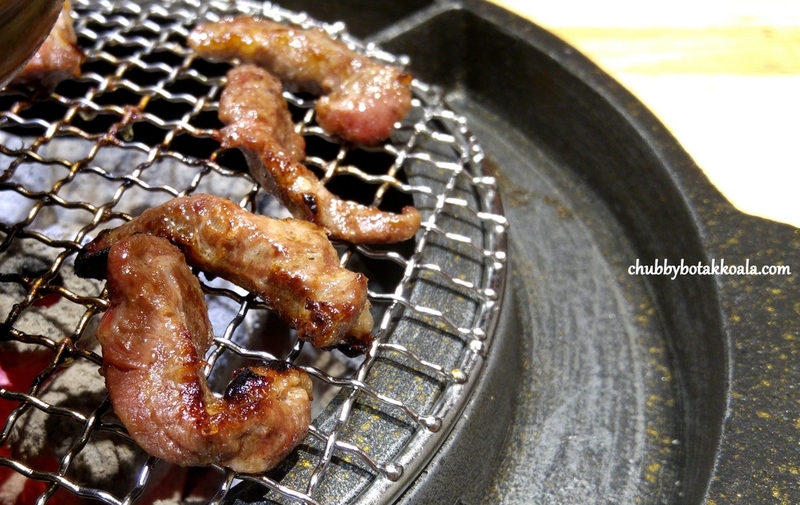 Cooked on round bbq mesh, where the meat has more exposure to the charcoal. We grilled it until it has a nice charred on the outside. The meat was slightly crisp on the outside while it retain it tender and succulent. It was delicious but does not really give me WOW. 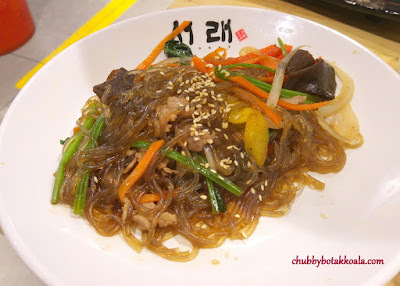 Followed with Hangjeongsal and Hangari Samgyeobsal. 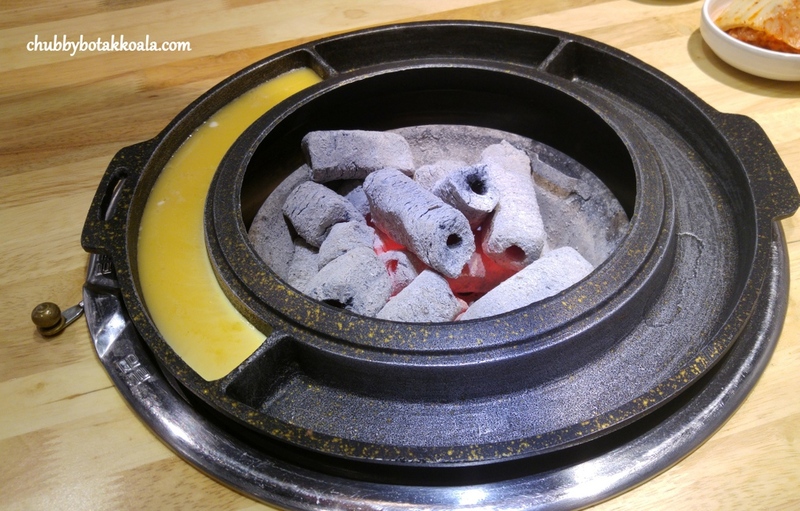 This time the bbq was changed to a more covered grill, with less exposure to the charcoal. My first encounter with Hangjeongsal (US Pork Jowl), was not a pleasant one. It was not cut properly, resulting in 80% fats, left with 20% meat. 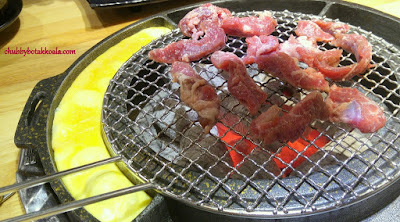 At Seorae, they trim off most of the fats, while the rest of the fats just melt during the bbq. Resulting in a super moist and succulent meat. Meanwhile the Hangari Samgyeobsal (Seorae Marinated Pork Belly with special soy-sauce) was just sublime. 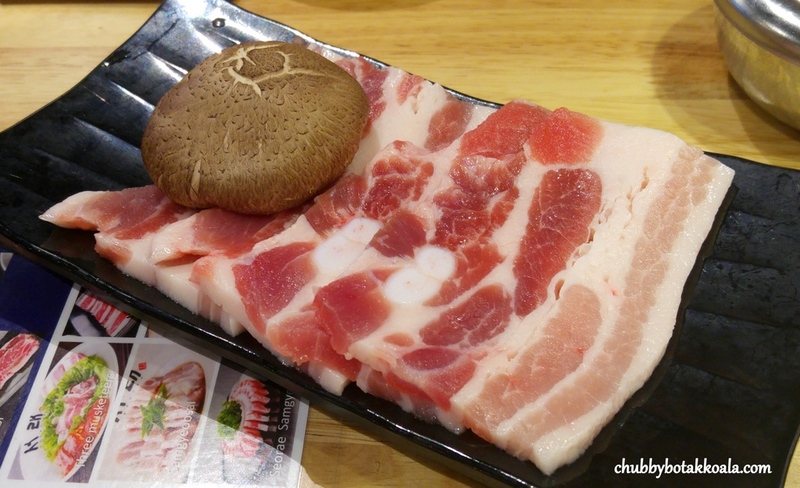 Each slice of the pork belly is about 5mm in thickness. 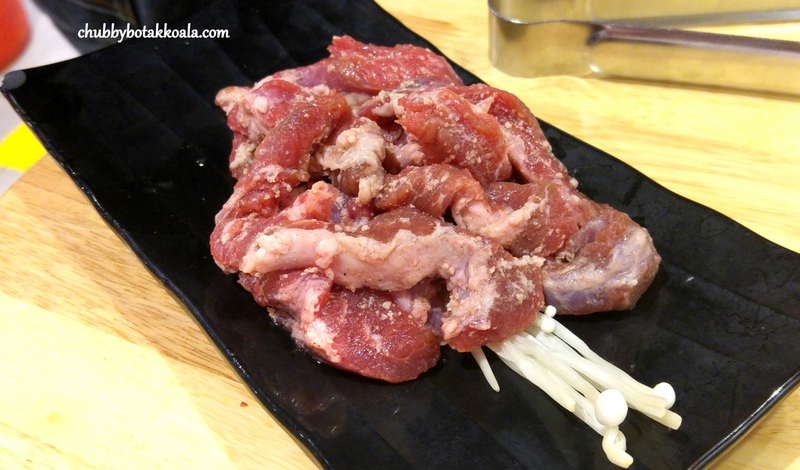 As it was marinated already, you can actually eat this without any sauce or salt. 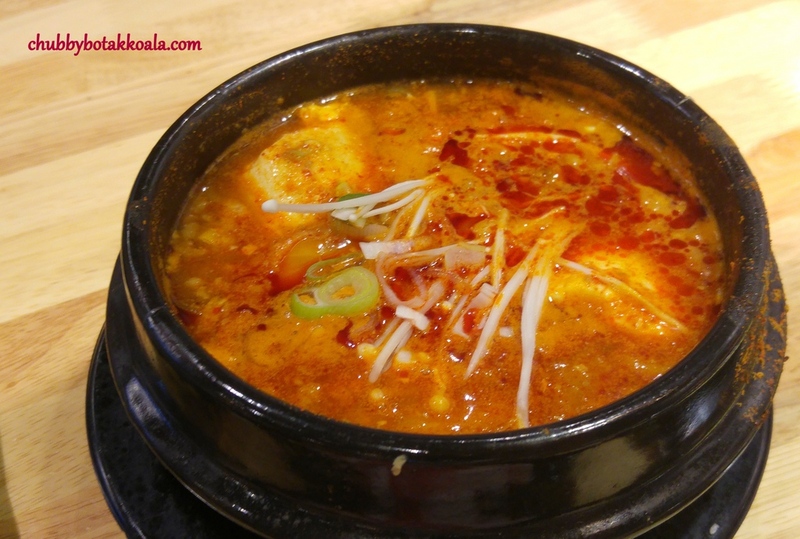 Came with the pork set, Japchae (Glass Noodle stirfried with US Pork) and Sundubu Jjigae (All time favourite spicy tofu, clams and mince pork stew). We both think that the glass noodle and stew is very ordinary. 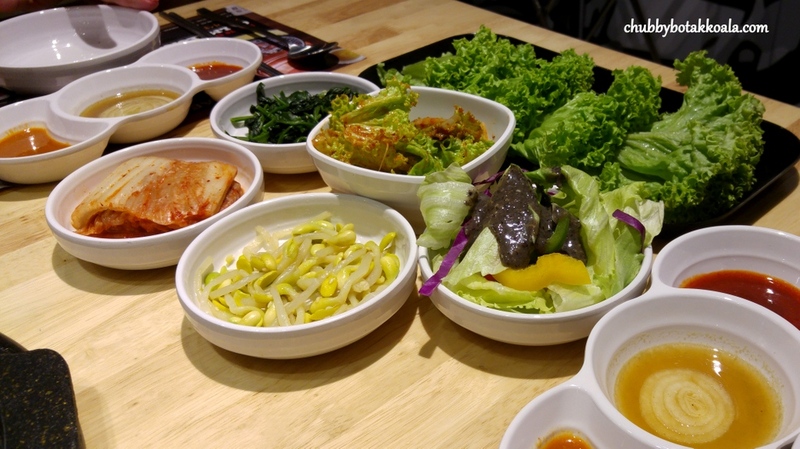 The same thing can be said about the side dishes, not much of variety and the portion looks small. Luckily, you can always ask for refill if needed. The pork set suppose to come with Strawberry Makkoli (Rice wine with Strawberry Fruits ), however, as we don't really take alcohol, they allow us to replace it with two servings of fruit tea. One item that catches our eyes when we go through the menu is Seorae Samgyeobsal ($24.90) - High quality pork belly in special Seorae cutting. 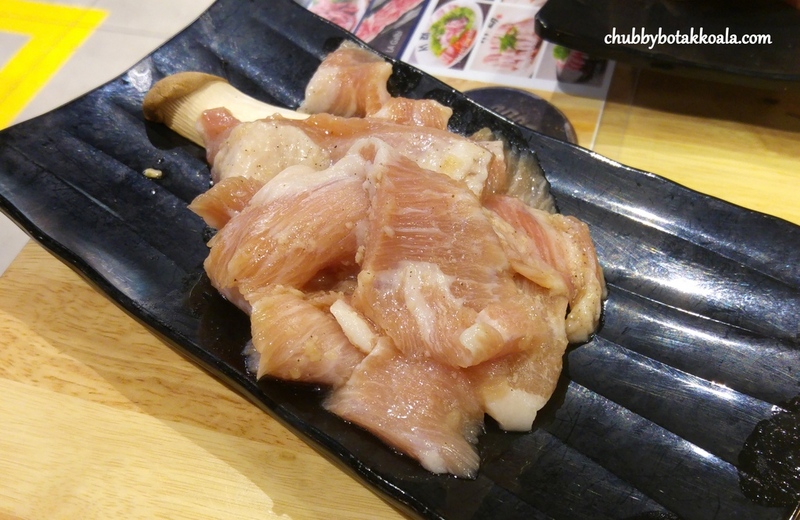 The thick pork belly was cut to about the size of your pinky finger. One of the manager help us to grill it. It was just amazing. Ok, I have to say, Porkgasm. It was so juicy and succulent and it basically melts in your mouth. Surprisingly, the thin part of the skin does not even feel chewy. 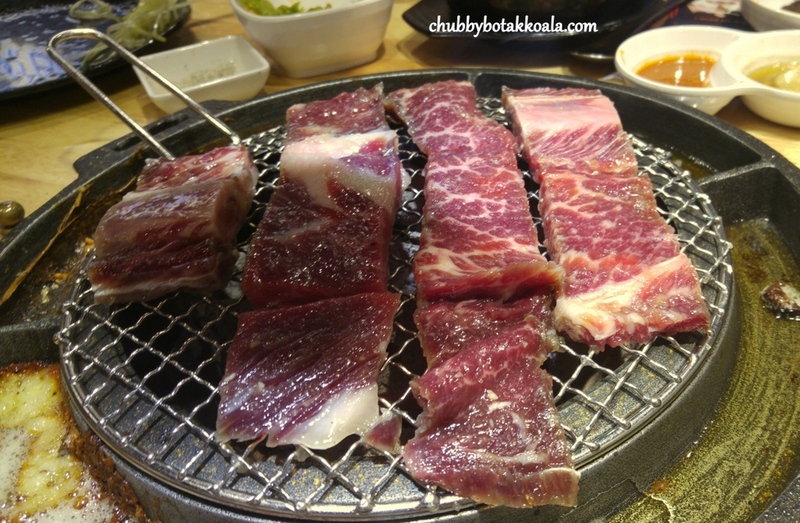 We wanted to order the Woosamgyeob (Thinly sliced beef belly) however they run out of it and we have to settle for So Galbi ($42.90) - Succulent US Prime beef short-ribs cut across the bones. Marinated overnight and grilled well done with sweet / juicy texture. The beef ribs is well marinated, though the meat looks like it has a very good marbling, it was slightly chewy. Definitely not as good as the pork here. 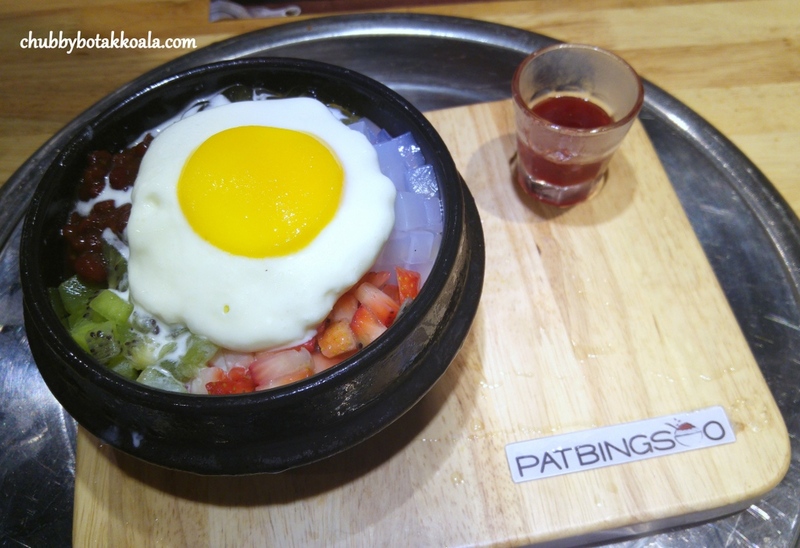 Dessert was none other than the Bibim Patbingsoo ($12.90) Fruits + Jelly + Pat (Red bean) + Strawberry sauce + Vanilla Ice Cream. This Korean version of ice kacang, basically has everything in it. Love the presentation where the jelly looks like fried egg. It was a good ending to the meal. The place is bright and spacious. Service here is very good. 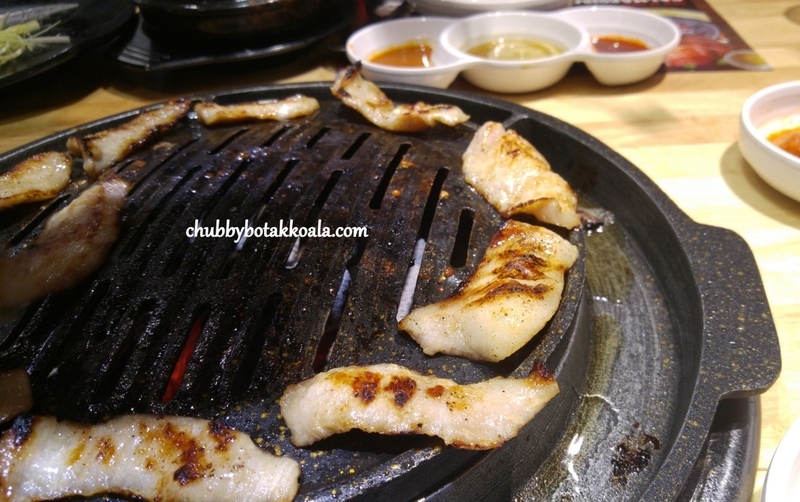 When we ordered the Seorae Samgyeobsal, the manager grilled it for us and he explain to use on the method of grilling it. In case you were wondering, there was no Korean service staff here. Please note, Seorae only take limited reservations, so if the reservations are all taken up, it is at a first come first serve basis. 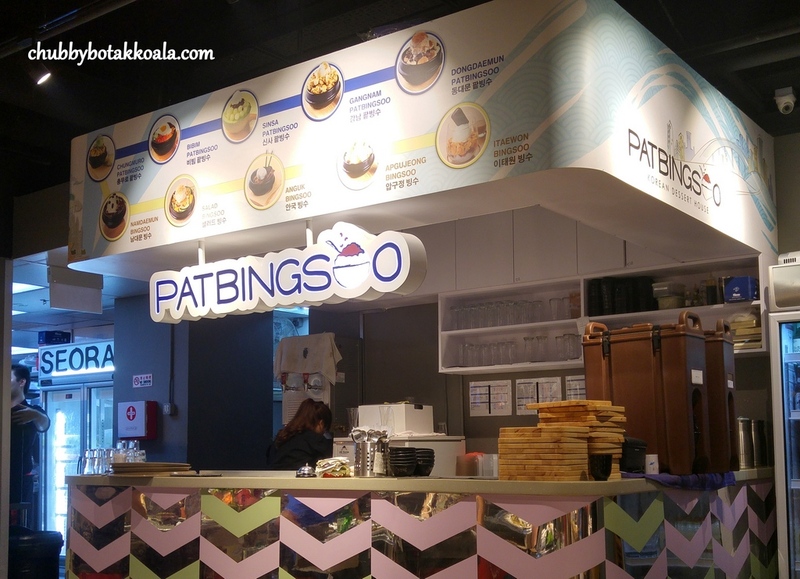 It seems to be the trend in most of the new restaurants in Plaza Singapura. Overall, definitely a place to go for your Porkgasm experience. Most cut of the pork are just sublime and enjoyable. Price is very reasonable compare to some of the older Korean restaurant in Singapore. We will definitely go back for more in the future. Cheers! !